The Vietnam War was in the end a tragic result. There were strategies that could have been implemented however that could have ended the war much sooner. If this had happened there would have been less deaths subsequently improving the attitude of the people at home about the war. Planes were shot down by surface to air missiles SAMs and the debris landed in civilian areas darkening the view held by the western world. This was the result of propaganda by the North Vietnamese government broadcasted into civilian homes, at home and subsequently shaping the views held by the people of the world. The soldiers who went there invariably came back in amidst a soured perspective by their own people. Anyway this is not a history lesson but a review and will treated as such. The first chapter of this series titled the Jolly Green Giant is about the crews of helicopter�s who were deployed to save aircraft pilot�s shot down by anti-aircraft fire. These brave, gallant young men were a pivotal form of salvation for the downed pilots during the war. This chapter was more simple and direct in its approach. Some parts were told, as a story about the pilots by the Vet�s themselves. Everything was concise and well put together into a cohesive whole. Watching this DVD was much better than an intermittent approach used on television or on the discovery channel. Every detail is conducive to the next and to study this war from an aircraft perspective is done with style. Almost all footage is taken from the war and many pyrotechnic displays are shown. The stories told by the vet�s are fascinating and even if the viewer has himself/herself not been in the war it is still an intriguing account and provides an insightful perspective of the Vietnam war. The second chapter looks at the operations carried out by some special operation�s pilots The Weasels. Their motto was first in last out and this is their side of the story. What the Weasels was a team of pilots that flew in first to get the enemy to lock-on to their aircraft and then using the lock-on the f-104�s jets would go in and blow the place up into oblivion. The second chapter is a little more convoluted than the first episode but is still interesting to any viewer. 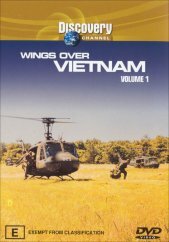 Overall this series will provide adequate information about the conflict by air and much of the footage was taken during the war. This provides an intriguing account of what the pilots did and had to go through. It is a shame about the result of the war but the pilots endured some pretty hair raising times and did the best they could under the circumstances.